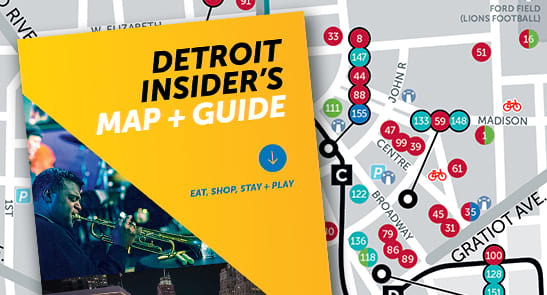 The Downtown Detroit Partnership has organized STEM-themed activations in downtown Detroit’s parks and public spaces that will be free and open to all beginning April 20. “We are excited to activate the parks with programming designed specifically for FIRST teams and their fans and to showcase that Detroit is one of the nation’s leaders in STEM,” said Robert Gregory, Chief Planning and Public Spaces Officer of the DDP. Wednesday-Friday from 10 a.m.-4 p.m. each day, FIRST Robotics attendees can head to the Detroit RiverWalk to see the view of Canada and enjoy some relaxing activities. Each day, visitors can do arts and crafts, a mini museum dedicated to shipping in the great lakes, oversized games, a mobile escape room, learn to fish and more. Arts & Crafts: Try your hand at making your own canvas masterpiece! FIRST participants are invited to create their own make and take mini canvas featuring the skyline of Detroit. Great Lakes Shipping Kiosk: Interested in how cars, iron ore, wind turbines and more make their way from Chicago to New York? Visit the Great Lakes Shipping Kiosk to learn about all the different types of ships that travel up and down the river transporting raw material and more throughout the Midwest to the East Coast and beyond. Fishing Station: Ever want to learn how to cast a fishing pole? Here is your chance. Conservancy volunteers will be teaching visitors how to cast a line and reel in a big “fish”. Mobile Escape Room: Partnering with Michigan Tech University, their career services Mobile Escape room will be on display on the RiverWalk. Participants can partake in 15/20 minute escape room experience with 5-7 of their teammates. Can you escape?